You may have got your video files from many sources: online video sites, your friends’ phones, celebrities’ blogs, camcorders, DVD/Blu-ray discs, torrents, professional video production software, etc. The problem is, there so many formats of them! So it is necessary to have an universal video convert to convert these video files into the most common format ever – MP4, making them accessible whenever you want on almost any platform, any devices. All2MP4 for Mac is such a tool to convert video to MP4. Why Convert 4K to MP4 on Mac? There are many reasons why you need to convert 4K or HD videos to MP4: to play those videos on the majority of media players and media devices; to edit them in video editing software; to upload 4K video to YouTube, Facebook or other video sharing sites without worrying about the file size. To solve these problems, you may need All2MP4 for Mac which provides you with all the bells and whistles you are looking for in a video converter program. It can convert videos in any formats with top quality and world’s fastest speed! Why Convert MOV to MP4 on Mac? The main reason we choose to convert MOV to MP4 sometimes is that it will make it possible to play the videos on multiple platforms, media players and devices. Thus it will never be a headache when an error comes up for playing the MOV video with your current media players. As the most comprehensive and powerful video converter, All2MP4 for Mac has the ability to batch convert any amount of video files with superfast conversion speed and the intuitive user interface allows you to finish conversion with just a few clicks. Why Convert MKV to MP4 on Mac? There is no gainsaying that people often have the problems like cannot play MKV videos on iPhone, iPad, PS3, Xbox, etc. or edit them in some video editing software. Even sometimes MOV files just can’t be played on your QuickTime or there is the sound but no picture. However, MP4 is the most popular video formats for phones, tablets and other devices. 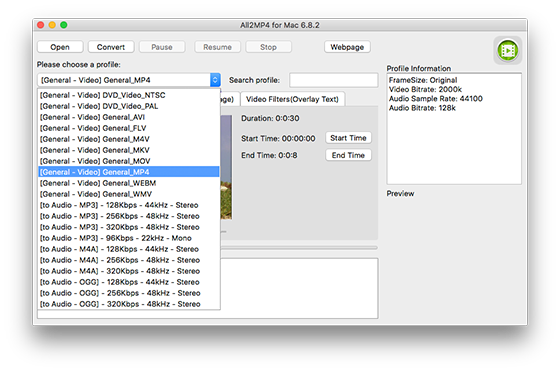 To diminish those problems, you can count on All2MP4 for Mac to convert MKV to MP4. It helps convert various types of videos to MP4 on your Mac like a breeze with its user friendly interface. Why Convert AVI to MP4 on Mac? AVI stands for Audio Video Interleave and it contains both audio and video data in a file container that allows synchronous audio-with-video playback. MP4 is a multimedia container format standard specified as a part of MPEG-4. It can also be used to store other data such as subtitles and still images. Compared with AVI, MP4 yields a much smaller file size for the same length of a video and is supported by most of the mainstream portable devices. If you are in a hurry to enjoy AVI videos on MP4 accepted media phones, try All2MP4 for Mac which can convert all videos to MP4 in high quality without yielding too much of your time for conversion. Why Convert FLV to MP4 on Mac? As we know, many online videos are in a Flash video format, also known as an .FLV file which requires a Flash player to watch them. So, what if you just want to enjoy them on any of your media players on the go? Don’t worry, there is an easy way to help you out of the dilemma. You can convert the videos in FLV into MP4 for universal playback with All2MP4 for Mac which is the complete on hand solution of all your video conversion needs. It supports all video formats including AVI, MOV, MKV, WMV, FLV, 3GP, DivX, XviD, RMVB, MPEG, VOB, MOD and 300+ other video formats. Why Convert WMV to MP4 on Mac? Though WMV is a quite hot video format developed by Microsoft, it seems to be a pesky video format for Apple users. Thus, what will do if you want to play WMV files on your Mac, iPhone, iPad or other Apple products? 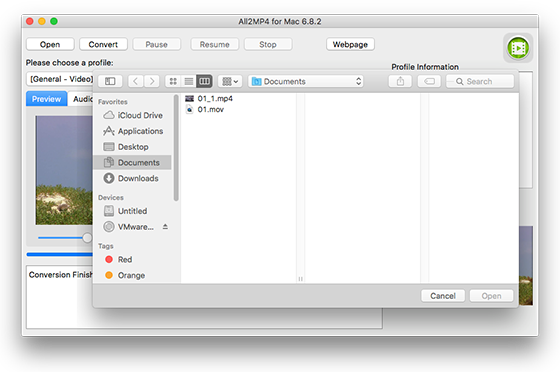 You will need to convert WMV to an Apple supported format like MP4 first. All2MP4 for Mac just comes in handy that it is not only a WMV to MP4 converter, but also a video converter that can convert most video formats with high quality and super-fast conversion speed. Why Convert VOB to MP4 on Mac? A VOB file is a container format used in DVD-Video media. Although it includes the complete contents of DVD like subtitles, menus, it is hardly possible to be played on smart devices. In such case, you can solve the problem by converting VOB to MP4 which is supported by almost all the popular devices. In addition, a MP4 file is of relatively teeny-tiny size, which would not encroach on too much storage space on your device. All2MP4 for Mac is an absolutely easy and free solution to convert videos from countless formats to MP4 as well as a selection of other modern and widely supported codecs. Why Convert 3GP to MP4 on Mac? 3GP is the simplified version of MP4, especially designed for mobile phone to record and transfer videos. 3GP video is usually in low resolution, low frame rate, low quality and low bitrate, Compared to 3GP, MP4 is the most widely used video format today with high audio and video quality and is supported by nearly any popular media players and devices. Fortunately, you’ve got All2MP4 for Mac which provides a versatile and professional way to convert 3GP and 300+ other video formats to MP4 with fast conversion speed and high output quality. 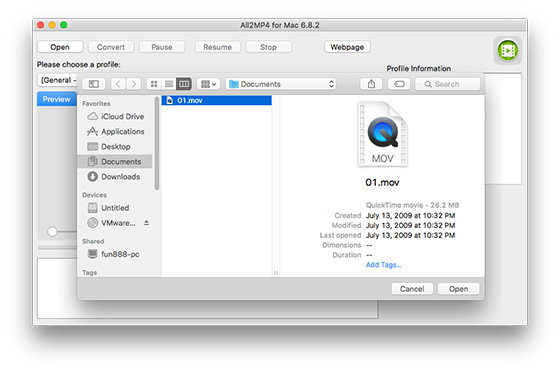 Once you have finished launching All2MP4 for Mac, click “Open” and in the popped up window choose the video file you want to convert, then click “Open” to load the video in the program window. Now, choose “MP4” as the output format from the list of video profiles in the dropdown menu of “Please choose a profile”. You can quickly find the format needed by inputting the format in the box of “Search profile”. When all settings are ready, click “Convert” to start your video conversion. After the process, click “Open” to find the output video file named as “xxx_1.mp4” in the source folder. More than that, there are some other advanced tools available: cut video, add overlay image/text to video and specify the value of volume and echo.